The thing that is starting to disturb me most about the RCC is how we seem to be going to route the Anglicans took in the 19Th century (With High, Low, and "Broad" church parishes becoming the staple of worship). 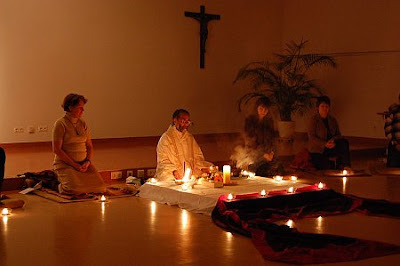 The modern divide in the RC liturgical life seems to be betwen those who want a higher "smells and bells" form of worship, including the Pope, those who want a less ritualistic, more evangelistic type of Mass (liberals, charismatics, etc..). Finally those who want a more "broader" type of worship and liturgy (Which would be about 90% of RC's and the majority of RC parishes that exist). 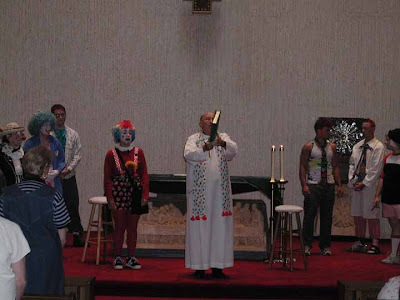 These churches will frequently strive for compromise between the ideals of the High and Low liturgical parties. In the old days of course there was non of this division in Catholicism (Mainly because there wasn't as much emphasis on things like liturgy as a form of "community expression" as there is today). The real irony about this is that the conservative/traditionalist RC's who are seeking to develop a more ritualistic form of Mass are really just subscribing to the principles of "communal liturgy" which the liberals were the ones to originally espouse. So we all become liberals and "modernist" in a sense. That's the modern world for you! The lines drawn are, like the Anglicans based on theological persuasion and politics which often spill over into the realm of liturgy. The RCC seems to be as divided as ever. Its only the Pope who keeps us all glued together, for now! We are living in a crisis of civilization, and the winds that are blowing have certainly buffeted the Catholic Church. All we can do is stick it out and do what we can to help: by becoming saints. Will the new "reform of the reform" continue to use the blasted ICEL and their phobia against men and preference for inclusive language? I'm afraid that will continue until a certain number of bishops "grow a pair" and tell the ICEL to get lost. Either that, or Rome is going to have to obliterate the ICEL and replace it with some good men. Yes, the Catholic Church needs a few more good men. Lord Jesus Christ have mercy. Right now the ONLY American Catholic bishop that TOTALLY stands for the Catholic Faith, started his own seminary, AND excommunicated all Catholic pro-abortion leaders is Bishop Fabian Bruskewitz of Lincoln, Nebraska. Is Archbishop Chaput also among the few good men? “All Catholics in and of the Diocese of Lincoln are forbidden to be members of the organizations and groups listed below. Membership in these organizations or groups is always perilous to the Catholic Faith and most often is totally incompatible with the Catholic Faith. Any Catholics in and of the Diocese of Lincoln who attain or retain membership in any of the above listed organizations or groups after April 15, 1996, are by that very fact (ipso facto latae sententiae) under interdict and are absolutely forbidden to receive Holy Communion. Contumacious persistence in such membership for one month following the interdict on part of any such Catholics will by that very fact (ipso facto latae sententiae) cause them to be excommunicated. Absolution from these ecclesial censures is "reserved to the Bishop." This notice, when published in the Southern Nebraska Register, is a formal canonical warning. By mandate of the Most Reverend Bishop of Lincoln. So according to this bishop, membership in the SSPX is perilous to the Catholic faith. If this were so, which it is not, then why did Pope Benedict lift the excommunications of the bishops of the SSPX? They are a schismatic group who believes that the Pope is a "semi heretic" and that the entire post Vatican II RCC can't be trusted. Even if they don't come out and say so officially, they act as if they are the last, faithful remnant of Catholics left in the world. They also take very purticannical/Jansenist view of morality which can lead to overscrupulousness and depression. Bishop Bruskewitz did the right and Catholic thing by excommunicating them. Would that all the worlds RC bishops, including the Pope do the same! The Pope lifted these excommunications in order to facilitate a reunion between the Vatican and the SSPX (Which seems to have failed miserably as the SSPX still denounces the Pope and his decisions often). And yet, without the SSPX, the old Tridentine mass would be dead. Surprisingly I've heard just the opposite, that the schism of the SSPX and their intrusions towards the Vatican lead to a mutual atmosphere of fear and suspicion which delayed the various "liberation's" of the Tridentine Mass much later then they would have been done. I've even heard that Cardinal Ratizinger was considering some form of "universal indult" as early as 1982, but this was stopped because of the continued disobedience of the SSPX to Rome. I don't find it suprising at all that many RC bishops and clergy find more solidarity with our separated Orthodox and Protestant brethren they with the schismatic SSPX. After all, at least the separated brethren are not openly opposed to Vatican II and such reforms as ecumenism and religious liberty. The SSPX on the other hand is die hard against them and, if they had there way the Church would be infiltrated with their likes and they would attempt to do away with Vatican II. There are those in and out of Rome who don't want that to happen anytime soon. at least the separated brethren are not openly opposed to Vatican II and such reforms as ecumenism and religious liberty. Well, maybe not in the same way or for the same reasons as the Rc traditionalist would be. Catholics are quite free to disagree with Vatican II's vague language on ecumenism and religious liberty. Groups like the St. Benedict Center, the Slaves of the Immaculate Heart of Mary, the Priestly Fraternity of St. Peter, the Institute of Christ the King Sovereign Priest, the Sons of the Holy Redeemer, the Institute of the Good Shepherd, the Society of St. Vincent Ferrer, and the Personal Apostolic Administration of Saint John Mary Vianney were never required to affirm Vatican II's characterization of these things when they were regularized by or established with the approval of Rome. How can they, when the murky language begs for clarification? Does the St. Benedict Center follow the teachings of Father Feeney? And wasn't Father Feeney excommunicated from the Roman Catholic Church? I'm sure that these groups must have to affirm some type of acceptance of Vatican Council II in order to be legitimately recognized as Catholic religious orders by the Vatican. It would set an extremely bad precedent if the hierarchy were to, on the one hand attack the cafeteria Catholicism of the left while turning a blind eye to the same actions on the right. After all if extreme groups like the St Benedict Center can openly declare that all non Catholics will be damned to Hell, then why can't a more progressive order like the Jesuits preach universal salvation? If there going to let one side get away with their own set of antics, then they must let the other get away with theirs too. Whenever a thread like this pops up with people chiming in about just how great the Tridentine mass is, and how wonderful it would be if it could just come back and displace the novus ordo once and for all, I consider it my duty to reply and say something like: Give me a properly celebrated novus ordo mass with good music any day over any Tridentine mass. I really wonder how many people who sing the praises of the Tridentine mass have ever actually been to one, and if they have, whether they were paying attention (as much as is possible for the laity to do in this mass!) to what was going on. The entire canon of the mass (ie anaphora)- all of it!- and many other important parts of the liturgy - are recited privately by the priest with a couple of acolytes or an acolyte and a deacon! Does the novus ordo have problems? There is no doubt that this is the case. It is in need of reform in so many ways, and yet it is clear in my mind that it is far superior the older mass, which is a showpiece for pre-Vatican II clericalism, among other problems. I agree with this 100%. Sacrosanctum Concilium called for significant alterations to the TLM, and the vote of the world's bishops to approve the changes was 2,147 to 4. So 99.8% of the bishops, all of whom, of course (except maybe some Eastern bishops) had grown up, been ordained, and been consecrated in the TLM, believed that change was needed. Bottom line, the Mass that is performed today is significantly closer to the manner in which Mass was done by Christians shortly following the time of Christ and I hope we never get away from it. As for the Priest facing away from the people, to me that is hogwash. We the faithful are the body of Christ through our adoption by the Father and we the faithful are the Church of Christ. God is not in the alter, nor in the crucifix behind it. He is in all of us through the gift of the Holy Spirit given in Baptism and Confirmation, he is in the Priest who is acting in the person of Christ during the Liturgy, and he is in the Eucharist in the form of the Body, Blood, Soul, and Divinity of Christ following the consecration. "For where there are two or three gathered together in my name, there am I in the midst of them" (Matthew 18:20). Why look somewhere else for God, when he is right there, with us? I admit wholeheartedly that there are far too many liturgical abuses out there. However, that can easily be fixed without altering the nature of the Mass. All the Holy See has to do is to tighten up the instructions for Mass to allow less wiggle room in terms of music, etc. and that will eliminate the vast majority of the problems. We have a tendency in the Western world to throw the baby out with the bath water rather than to make small adjustments to get things on track. I am hopeful that the implementation of the new Roman Missal coming this advent will help to facilitate this process. Our Diocese is mandating standardized music for the first year following its implementation which I think is a good idea. Fr. Feeney was reconciled with the Church: "In 1974 Fr. Leonard Feeney SJ was reconciled and absolved from the excommunication by Pope Paul VI and special Vatican delegates. Many of his followers were subsequently reconciled to the local diocese. They could retain their strict interpretation of the Roman Catholic Dogma Extra Ecclesiam nulla salus, as diversity in the evaluation of the practical implications of EENS, according to diocesan officials, had to be tolerated. Most his followers adhere to the Tridentine Mass under the 1988 Ecclesia Dei Indult."
. It is in need of reform in so many ways, and yet it is clear in my mind that it is far superior the older mass, which is a showpiece for pre-Vatican II clericalism, among other problems. The other thing I would add is that many of those who clamor for the TLM may not understand just how Biblical the Ordinary form of the Mass is. I could be wrong and I don't want to accuse anyone of ignorance without cause, but I would encourage Catholics in the Latin Rite to read Scott Hahn's - The Lamb's Supper which does a fantastic job of showing how the Mass relates to the book of Revelation in a number of different ways. After reading multiple defenses of both the TLM and the OF I am completely convinced that the OF is much more Biblical and much closer to how the Liturgy was celebrated by the first Christians. "Can a Feeneyite be a Catholic in good standing with the Church? The Holy Office assured us that such is not possible. Was the "reconciliation" of Fr. Feeney and his "spiritual descendants" licit? Not under Canon Law." Bottom line, the Mass that is performed today is significantly closer to the manner in which Mass was done by Christians shortly following the time of Christ and I hope we never get away from it. As for the Priest facing away from the people, to me that is hogwash. We the faithful are the body of Christ through our adoption by the Father and we the faithful are the Church of Christ. God is not in the alter, nor in the crucifix behind it. I find myself compelled to answer this and it is a struggle to answer in a polite fashion. In the Tridentine Mass and the myriad of Divine Liturgies that the Orthodox (Byzantine and non-Byzantine) use, the priest DOES TURN HIS BACK ON THE PEOPLE. All face towards GOD. In the early Church and even up to the Middle Ages, Churches, Catholic and Orthodox faced the East, because the Garden of Eden was in the East, and Christ will come again from the East. If you say the priest is turning his back on the people in the Tridentine Mass, older Catholic Masses and the Orthodox Divine Liturgies, your understanding of worship is flawed. Tell me, why is it, with exception of the Novus Ordo, and the Maronite Liturgy, all other ancient Churches face the EAST? When I was in the RCC, I had hoped that someone would simply take the old Latin Mass and, er, let people us a local-language translation of it. Just read what was on the 'other side of the page' in the old books! I did read a draft copy of the forthcoming liturgical manual, and it sounds like in some ways, that's almost what they've done. I wish them well. That has been my understanding as well, Robb. The presence of the SSPX were not at all helpful. It seems to me that the ordinary lay man and woman and the activities of the Priestly Fraternity of St. Peter did far more to move the reform of the reform along. Keep in mind that the Priestly Fraternity of St. Peter was formed from the SSPX in 1988 in the wake of Archbishop Lefebvre's consecrations of the four bishops. Also keep in mind that Ecclesia Dei, which encouraged bishops to give permission for the traditional Mass in 1988, was itself a response to those illicit consecrations. In the early 1980s John Paul II formed a committee to examine whether the traditional Mass had been abrogated, and the committee (of which Cardinal Ratzinger was a member) determined that it had not. But John Paul did not "liberate" (if that's that's the right word for encouraging, not requiring, bishops to give permission for something that didn't even need permission) the traditional Mass until Lefebvre took the nuclear option (the bishop consecrations) in 1988. So, yes, the SSPX was critical in the process of liberating the traditional Mass. Want more evidence? Summorum Pontificum was a response to an explicit request by the SSPX; such a liberation was one of the requisites before dialogue could begin again (the lifting of the excommunications was another). You want another sign? 1962 is an arbitrary date at which to set the currently approved traditional Mass. The traditional Mass underwent reforms in 1964, 1965 and 1967. But the Holy See went back to 1962. Why? Because the SSPX was exclusively using the 1962 Missal in the 1980s when loosening the restrictions was first considered on a major basis. I am not going to carry the SSPX's water, and I am not a supporter. But honesty demands the admission that they were pretty much the only major force in the Catholic Church in the 1970s and 1980s which refused to accept the unjust and illegal suppression of the traditional Roman rite. 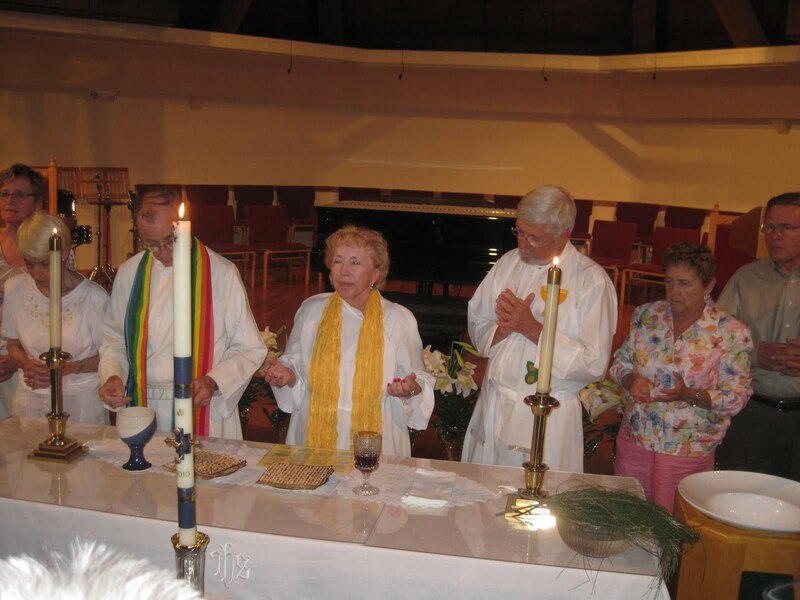 The gist of it is that the "which is desirable whenever possible" in context is referring to the placement of the altar, not to the orientation of the celebrant. You are right that celebrants are not forbidden to celebrate Mass facing the people. But the weight of tradition, as well as sound liturgical, psychological and sociological principles, favors facing East. And, sadly, many bishops effectively forbid priests from celebrating in the traditional direction. It is this intolerance of tradition that is most unjust. But he also appears to be saying that the real, bodily, and substantial presence of Christ in the Eucharist is equal/the same to the spiritual presence of Christ in the congregation. That is a VERY PROBLEMATIC statement for a Catholic to make, and I hope he clarifies it. That is not what I was saying at all. I was merely making the point that God is present in the Mass in multiple and real ways and that I don't believe we need to go looking to find him as he is already there. I don't know how I can make it much clearer than I have that I FULLY and COMPLETELY believe that Christ is truly present in the Eucharist. Body, Blood, Soul, and Divinity. That does not rule out the idea that their disobedience slowed the process. The very fact that the Priestly Fraternity had to break away to get and keep the "ear" of the Vatican is case in point. I am very close to old members of the Fraternity and they have worked ceaselessly over the years proving that a return to the original forms would not perpetuate further rupture and disobedience. So I understand what you are saying but I do not believe that disobedience furthers much of anything in the Church. You were very clear in your original note...FWIW from me. 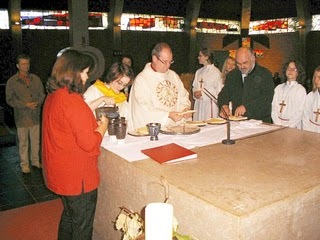 And is his presence in the congregation similar to this Eucharistic presence? LOL. You remind me of one of the local EO priests explaining the Eucharist. Though not as dramatic and funnier. That is, is God present before prayer? What about when we invite Him to our worship (Great Entrance)? what about after the consecration? Wasn't He here the whole time? Well, of course! But we believe that it is somehow in a stronger way by and for the worshipping faithful. No. You're fishing for something that isn't there and its about time you move on. 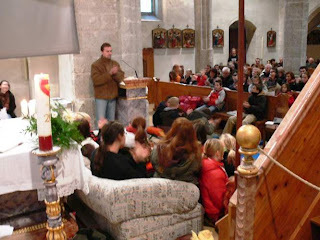 His presence in the congregation is through the gift of the Holy Spirit present in all baptized and confirmed faithful. His presence in the Eucharist is in the literal body and blood of Jesus Christ. After reading multiple defenses of both the TLM and the OF I am completely convinced that the OF is much more Biblical and much closer to how the Liturgy was celebrated by the first Christians. First, please explain why you think the new Mass is "much more Biblical" than the traditional Mass. Exactly what does this mean? Second, "how the liturgy was celebrated by the first Christians", in other words, liturgical archaeologism, is not what we are aiming at---not to mention it being impossible to accomplish because so much of it is speculation for lack of surviving evidence. As I see it, the problem with a large part of modern liturgiology is that it tends to recognize only antiquity as a source, and therefore normative, and to regard everything developed later, in the Middle Ages and through the Council of Trent, as decadent. And so one ends up with dubious reconstructions of the most ancient practice, fluctuating criteria, and never-ending suggestions for reform, which lead ultimately to the disintegration of the liturgy that has evolved in a living way. (the last sentence of this encyclical is also translated in English thus: It is a wicked movement, that tends to paralyse the sanctifying and salutary action by which the liturgy leads the children of adoption on the path to their heavenly Father). As for the Priest facing away from the people, to me that is hogwash. We the faithful are the body of Christ through our adoption by the Father and we the faithful are the Church of Christ. God is not in the alter, nor in the crucifix behind it. He is in all of us through the gift of the Holy Spirit given in Baptism and Confirmation, he is in the Priest who is acting in the person of Christ during the Liturgy, and he is in the Eucharist in the form of [?] the Body, Blood, Soul, and Divinity of Christ following the consecration. "For where there are two or three gathered together in my name, there am I in the midst of them" (Matthew 18:20). Why look somewhere else for God, when he is right there, with us? Well, since God is present everywhere, why should we bother even going to church to worship? He's present here right at home, gathered here with my family. Don't you see that your argument against ad orientem worship above makes it seem that you think Christ's presence in the Eucharist is just like his other "presences"? That his Eucharistic presence is not something altogether different? Considering that I have already stated that I don't believe they are the same, no. Well, since you admit that Christ's Eucharistic Presence is something altogether different from the other presences, do you agree that it might be good to give particular emphasis to this during the Mass, which is the re-presentation of the Sacrifice of Calvary to the almighty Father? It is an offering, an oblation, not to ourselves, but to the Father. We unite our hearts with the priest in presenting this offering. Where should the emphasis of the Mass be, on the congregational meal or the offering of the supreme Sacrifice? That is the question of the liturgy today. The examples pictured are some more extreme examples, but I'm afraid they still occur under diocesan auspices. And less extreme examples, which no less obscure the liturgy's sense of sacrifice, are quite common. I have to deal with them all the time, unlike you who go Orthodox.